WBS Schedule Pro contains a seamless integration to all versions of Microsoft Project. The bi-directional communication between WBS Schedule Pro and Microsoft Project means that you can go back and forth between the two tools with the click of a button with all data dynamically updated. Use WBS Schedule Pro as a front-end planning tool or create WBS, Network and Gantt charts of your existing Microsoft Project plans. When you create a WBS Schedule Pro chart of an existing Microsoft Project plan, all changes made in the chart are immediately reflected in the Microsoft Project plan. This means that you can add, delete, reorganize and update tasks in your Microsoft Project plan using WBS Schedule Pro. Add buttons and/or Tabs to Microsoft Project for one-click access to WBS Schedule Pro. You are prompted to add these buttons the first time you run WBS Schedule Pro. Once installed, simply open a plan in Microsoft Project and click the WBS, Network, Gantt or Sheet button to display a chart of your choice. WBS Schedule Pro also contains a Microsoft Project button so you can return to Microsoft Project at any time. It doesn't get any easier than this. Create projects first in WBS Schedule Pro and then transfer these to Microsoft Project at any time with the simple click of a button. All task and resource information entered into the WBS Schedule Pro project is transferred to Microsoft Project where additional scheduling can be performed. You can then continue to switch back and forth between Microsoft Project and WBS Schedule Pro as needed. There is no easier way to create your Microsoft Project plans than by using WBS Schedule Pro first! WBS Schedule Pro can be used to generate presentation-quality WBS Charts directly from you existing Microsoft Project plans. Microsoft Project supports WBS Coding and also supports Indenting tasks, both of which define the breakdown and structure of a project. Using WBS Schedule Pro to visualize this structure in a WBS Chart is the next logical step. Display and manage your Microsoft Project plans more efficiently using the WBS chart in WBS Schedule Pro. Superior Network Charts can be created from your Microsoft Project plans to better display the dependencies in your project. The Network Chart in WBS Schedule Pro displays a minimum amount of overlapping lines, less white space, no bulky boxes, just a clean Network Chart display that you can understand. Chinese (Simplified), Chinese (Traditional), Czech, Danish, Dutch, French, German, Hebrew, Italian, Japanese, Korean, Norwegian, Polish, Portuguese (Brazil), Portuguese (Portugal), Russian, Spanish & Swedish. If you are using a version of Microsoft Project not included in the above list, contact us and we will help make WBS Schedule Pro compatible with your version of Microsoft Project. By using Filters in Microsoft Project you can display certain tasks based on specified criteria. By applying a Filter in Microsoft Project and then creating a chart in WBS Schedule Pro you see just the tasks you want. In a WBS Chart this allows you to see a breakdown of a section of your project and in a Network Chart this is a great way to Trace dependencies on selected parts of your project. Why use WBS Schedule Pro with Microsoft Project? For Easy Project Planning - As a planning tool, WBS Schedule Pro makes is easy to plan any project by giving you the tools and intuitive user interface to produce projects fast. For the Seamless Integration - No other planning and charting software on the market today allows this level of functionality for managing your Microsoft Project plans. For the WBS Charts - WBS Charts are not available in any version of Microsoft Project. Microsoft Project lets you indent tasks in a Gantt Chart to represent the structure of the project but there is no way to visualize this in a top-down graphic or WBS Chart. 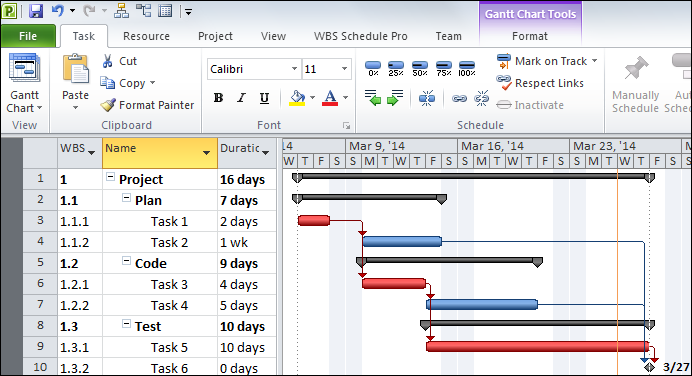 Creating a WBS Chart in WBS Schedule Pro from your indented Gantt Chart is the perfect way to visualize the structure you created in your Microsoft Project plan. For the Network Charts - The Network Charts in WBS Schedule Pro are simply better than Microsoft Project's Network Chart. If you have a need to produce Network Charts from your Microsoft Project data, WBS Schedule Pro's Network Charts are much easier to read and print on far fewer pages. There are also numerous advanced features for working with Network Charts that are not present in Microsoft Project. "I’m a Project Management Consultant and in my line of work I have two tools; your software and Microsoft Project. My engagements always start with your software and I can spend days with it and my client before we even open Microsoft Project. But once we do I am so grateful for the integration between your software and Microsoft Project. It saves us countless hours by not having to recreate the plan in Project. Your software has proven to be a great asset." "We've struggled in the past developing plans with Microsoft Project. It was always so difficult and time consuming. I gave my team your software to use with Microsoft Project. They love it and use it in every planning meeting. Your software makes it unbelievably easy to plan our projects."